When delicious baked goods become lethal, it's time to find a killer. The Amish Artisan Village in Middlebury, Indiana, has been decorated with every color of balloon and flower for the Race for a Cure. As manager of the Village, Amber Bowman is thrilled to see the turnout?and relieved to have something to distract her from the ?Poison Poet? ?an individual who has been sending notes containing bad poetry to warn of poisoned baked goods. Then Ryan Duvall crosses the finish line of the race?and falls down dead, murdered in broad daylight. But who did it? And why? The police suspect Preston Johnston, but Amber refuses to believe her employee could do such a thing. Amber once again looks to her young Amish friend Hannah Troyer to help her find the killer?and to determine if it's the same person leaving the cryptic poems and pies. Can they help the police before the Poison Poet strikes again? Both Amber and Hannah will need to draw on their faith as they fight to preserve the peaceful community they've built at the Amish Artisan Village. 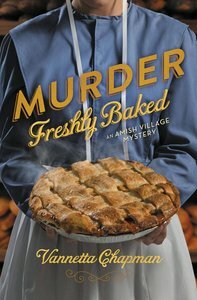 About "Murder Freshly Baked (#03 in Amish Village Mystery Series)"
Customer Reviews For "Murder Freshly Baked (#03 in Amish Village Mystery Series)"
Another excellent novel from Vanetta. She has created a multi-layered story - part murder mystery, part small town life focused. Meanwhile, she competently delivers a message of hope and taking second chances. I love this series, and enjoy how the author manages to make murder in a small town believable. I was more interested in the side story of ex-serviceman Preston in this novel, and his relationship with his new service dog. This opened my eyes to the amazing work service dogs can provide for people facing all sorts of daily living challenges, not just guide dogs for hearing or sight difficulties. Renee Ertl has done an excellent narration for the entire series, allowing the reader to feel a part of the fictional world. One of the better audiobook narrators in the Christian Fiction world. I recommend it.